With an estimated incidence of 1 in 100 live births, bicuspid aortic valve (BAV) is the most common congenital heart defect. Approximately one third of patients develop serious complications, which may include dilatation of the aorta, stenosis, regurgitation, aortic aneurysms and dissection. Current clinical methods poorly predict which patients will develop complications and thus fail to guide decisions for early intervention. Advanced blood flow imaging methods for assessing abnormal hemodynamics in the aortic root and ascending aorta may permit the development of tools for risk factor stratification. The aim of this study is to analyze the blood flow patterns in the aortic root by 4-D phase-velocity encoded MRI to determine their value as an indicator for the development of complications in patients with BAV. This early report analyzes the relationship between blood flow patterns in the aortic root and ascending aorta and aortic dilatation in a pilot population of teenage patients with BAV and normal control subjects. Nine asymptomatic BAV patients (8 male, 1 female, ages 16–18) and 6 control subjects (4 male, 2 female, ages 10–16) underwent a cardiac MRI study on a GE Signa TwinSpeed 1.5 T scanner. 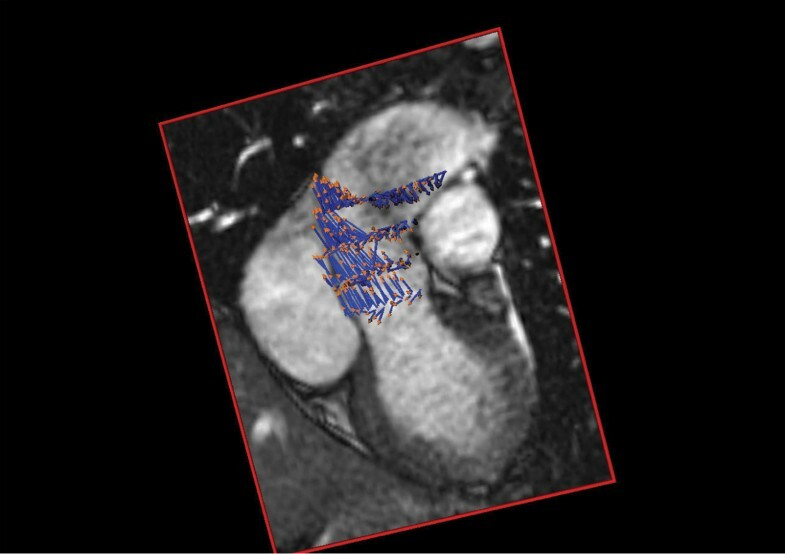 Structural breath-held SSFP ciné images included a 4-chamber view, two orthogonal planes through the left ventricular outflow tract, the aortic valve plane, and "candy-cane" view through the aortic arch. Breath-held 3-D velocity-encoded ciné acquisitions were obtained in seven slices at, proximal, and distal to the aortic valve plane. In addition, respiratory-compensated 4-D ciné flow data were obtained through the entire aortic arch region. Figure 1. Blood flow patterns were analyzed with in-house HeartViz/FlowViz software, using combined 3-D visualization of blood flow and structural images. The aortic root channel axis at systole was calculated from border definitions in two orthogonal views through the aortic root axis. The direction of the systolic flow jet through the valve plane was determined from 4-D velocity data. The angle between these vectors, a quantitative parameter of misdirected valvular flow, was hypothesized to be associated with aortic dilatation. Dilatation, adjusted for body surface area, was calculated as a z-score from linear cross-sectional measurements at the aortic valve annulus (AoV), mid-sinus of Valsalva (SoV), and the sinotubular junction (STJ). Flow jet asymmetry was also evaluated by quadrant analysis methods from through-plane flow. Correlations between variables were assessed by Pearson test, with Mann-Whitney U test to determine significance. A significant correlation was found in BAV patients of the systolic flow jet angle with aortic dilatation at the AoV (r2 = 0.833, p = 0.005) and the SoV (r2 = 0.685, p = 0.04) levels. In control patients no significant correlation between aortic sizes and flow jet angle was found. Across both groups combined, we found significant correlations between the systolic flow jet angle and dilatation at all three levels (AoV: r2 = .78, p = 0.001; SoV: r2 = .71, p = 0.003; STJ: r2 = .54, p = 0.04). No significant correlations were observed in BAV patients of flow jet angle with dilatation at the level of the STJ, or of any quadrant asymmetry parameter with dilatation at any level in either group. We have observed a link between the direction of the systolic flow jet and aortic dilatation in BAV. This is consistent with a possible causal relationship, which will be investigated in continued research on this patient population. This work was supported in part by NIH grants R01HL077627 and P41RR09784 (Stanford University). The authors thank Drs Marcus Alley and Norbert Pelc for help with 4-D flow imaging software, and Dr Rudolf Beekman of Leiden University for his valuable insights and medical student mentorship.